It's no secret that Viget HQ has its very own Ms. Pac-Man machine. Squidoo gave it to us, once upon a time, as a thank-you for all of Viget's hard work for them. 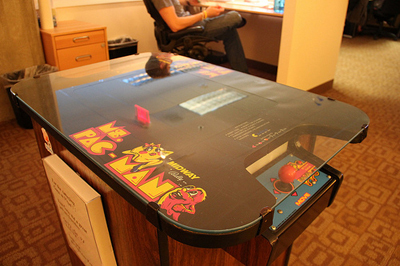 Over the years, Ms. Pac-Man went through ups and downs in the office. Sometimes she was popular; sometimes months went by without so much as one game played. But since the front-end development team adopted her last year, quite a few of us have gotten hooked and lost a fair number of hours to ghost-chomping and fruit-chasing. But we're Viget! We're not content to merely play a 30-year old arcade game for fun! Or even for intense competition (and, oh, it's intense. The all-time Top 10 Scores list is covered in sweat and tears.) So in order to use our Pac-Man addiction for good, we've come up with Dots For Tots, a gaming marathon to raise funds for Child's Play, a charity that gives games to children's hospitals worldwide. In the same vein as popular gaming marathons like Mario Marathon and Desert Bus For Hope, we'll play Ms. Pac-Man for donations. The more money raised, the longer we'll play. The initial goal is to play for eight hours and raise $1,200 but the game will extend as long as donations keep coming in! The event's on March 25, starting at 8am EST. We'll be broadcasting the marathon live over at Dots For Tots. There's a core team of players: Trevor, Jason, Blake, and myself. But throughout the day plenty of other Viget folks will be making cameos and popping in to catch a game or two. During the event, you'll be able to watch the action, tweet or chat with us via UStream, and check how the donations (and subsequently how many hours we'll be glued to the game) are adding up. We're not sure if an entire day of Ms. Pac-Man will turn us bitterly against each other as we battle for spots on the Top 10 board, or if we'll only end up loopy, but either way it promises to be a bit of fun and entertainment that will support a great cause. So check out dotsfortots.org, donate, and mark March 25 on your calendar!